Meet the 10-Year Old Entrepreneur Taking the Fashion World by Storm! Hailing from Johannesburg, South Africa, 10-year old Enhle Gebashe is already pursuing her dreams of becoming a well-known fashion designer and entrepreneur. 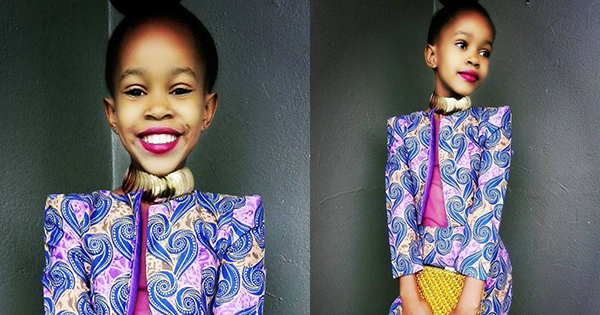 She most recently founded Enhle Babes Couture, a children's clothing brand specializing in glamorous African prints. Aside from the overwhelming number of orders, several doors have opened for her, including training opportunities and mainstream media interviews! Enhle is a fifth-grade student at Rosebank Primary School in Johannesburg. She says her garments are all custom-made to meet the needs of her target market -- girls ages 4 to 12. She envisions designing African prints, dresses, and anything in between that "princesses" can wear. So far, the support she received exceeded her expectations. "So many people known me," she told IOL. "I can't believe this is happening to me. At school I'm getting so much attention, the people who used to bully me are now respecting me. The response is amazingly surprising for us." As a young entrepreneur with a hectic schedule, Enhle doesn't have much time to play like other children. After school and every weekend, she goes shopping for fabric and doing photo shoots for her creations. What started as an idea to make extra money for school trips is now becoming a reality. Enhle has been offered to study by a local design school on a part-time basis. Award-winning scientist Thulile Khanyile, who is her mother's friend, also wanted to mentor her on the basics of money, saving, and business. She has also been in-demand in magazine and TV features. Regardless, she is still wowed by every like and comment she receives from her social media posts. Her mother, Desiree, is very happy for her daughter's achievements. But she is still cautious about it. "Our plan was never to get her to be famous," Desiree said. "I just wanted her to do what makes her happy, which is designing. I fear that she is very young for all this fame, so we need to be very careful about how she is handled going forward." Sometimes, Desiree still can't believe what her daughter has achieved at such a young age. She said, "I've always known that Enhle is going to be something big one day. I kind of had it at the back of my head but I didn't know it was going to be something this serious." Enhle aspires to someday be able to open up her own shop and reach out to other African countries as well. She credits her achievements to social media for helping people become aware of her creations. She said, "Nobody would know about Enhle if it was not social media. Social media has been the main marketing strategy for us."